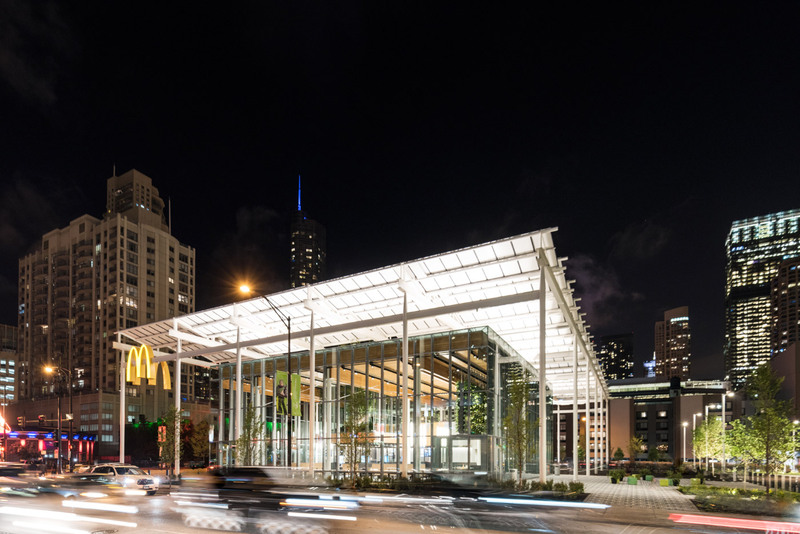 Eight months after Chicago’s iconic Rock ’N’ Roll McDonald’s was torn down (likely to the chagrin of the late Wesley Willis, who immortalized the building in song), the Ross Barney Architects-designed replacement has opened. The new building in River North bucks the campy, retro look of the original 1983 building, which was hemmed in by golden arches on either side. 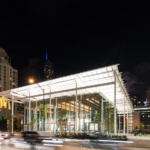 Instead, Chicago native Carol Ross Barney has designed the flagship McDonald’s with an eye towards sustainability and airiness as part of the company’s McDonald’s of the Future rebranding. 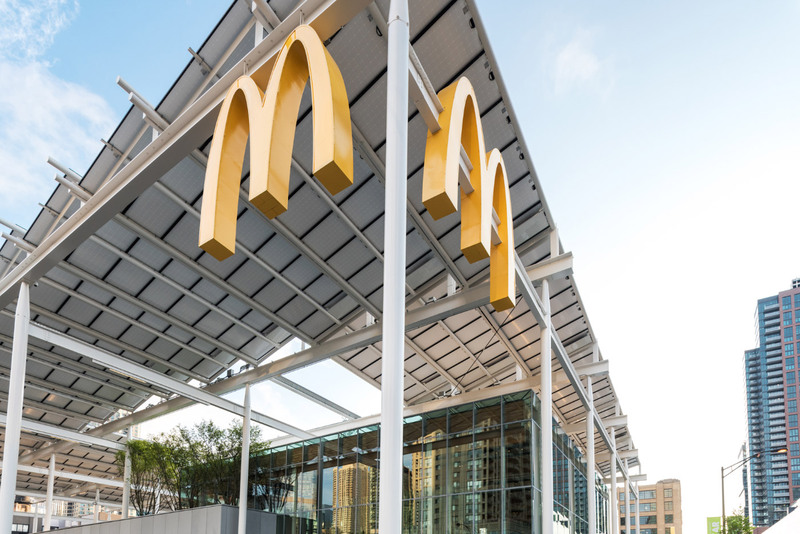 The corporate offices have paid for the entire project instead of the local franchisee as part of a wide-ranging renovation scheme, including the installation of self-ordering kiosks, that will affect locations across the U.S. through 2020. Carol Ross Barney’s design wraps an industrial steel-and-solar-panel canvas around the central building, recalling Renzo Piano’s most recent institutional projects. 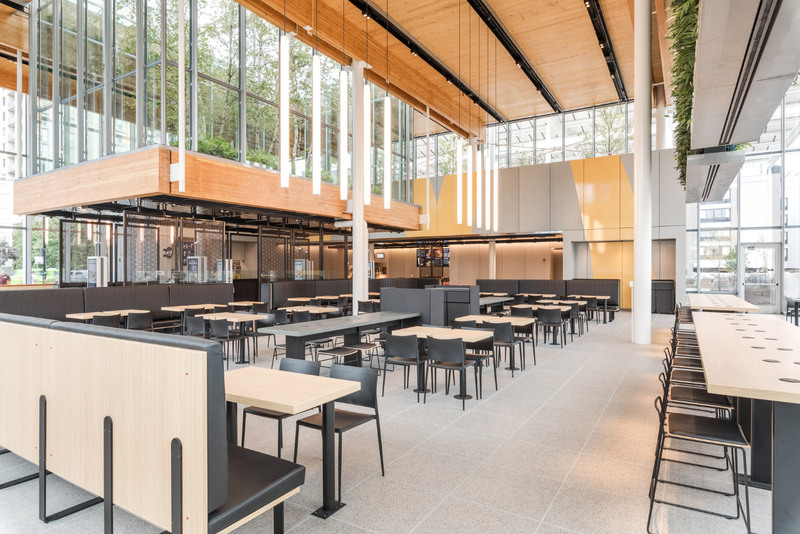 The new McDonald’s is only 19,000 square feet and a single story, which is 20 percent more compact than its predecessor, but the ceiling soars to 27 feet high. 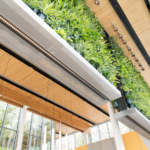 Cross-laminated timber was used for the building’s roof and was left exposed on the underside. 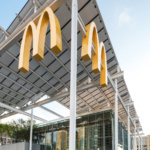 McDonald’s is heavily touting the project’s sustainability bonafides. 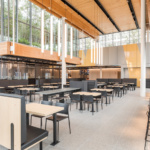 Carol Ross Barney also designed the building’s HVAC system and kitchen to use less electricity, and a McDonald’s representative claims that the new store uses 50 percent less energy than its rock and rolling forbearer. 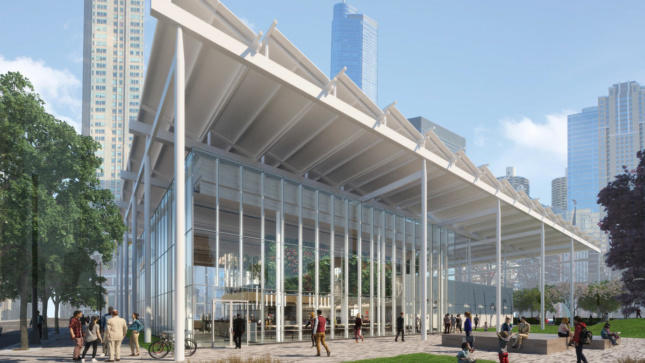 The serrated solar pergola shades the plaza around the entrances and is expected to generate up to 60 percent of the building’s electricity needs. 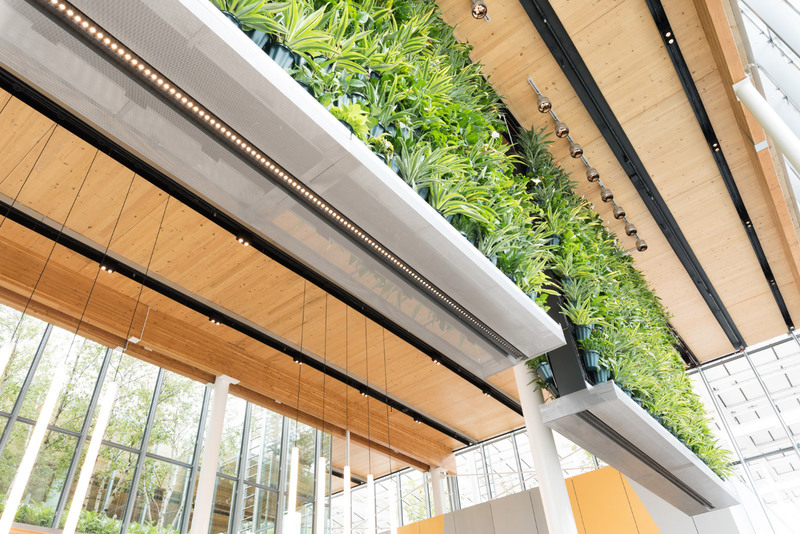 Plants have been integrated throughout the project site as well as inside of the building, and diners can eat under cascading green walls suspended from the ceiling. 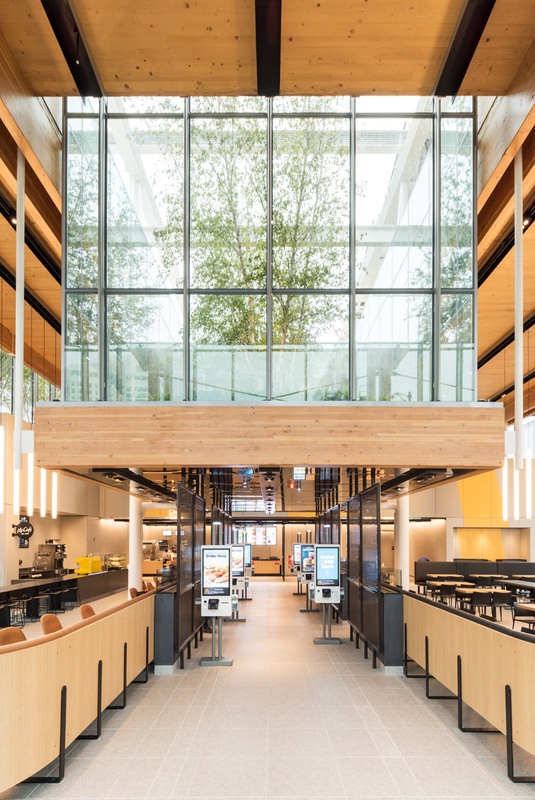 A sunken green roof in the middle of the restaurant provides guests with views of the apple trees, arugula, broccoli, kale, and native grasses being grown on the building’s exterior; McDonald’s has said that over 20,000 square feet of the site is landscaped. It’s more metal than rock and roll, but as of yesterday Chicagoans can once again get their burger fix in River North. As of August 8, the McDonalds will be open 24/7.